Cordless and compact - the battery operation and low profile design allow you to clean in tight, hard-to-reach areas with ease. Productive – the scrubber sprays solution down, agitates soil from floors, and vacuums the floor dry in one quick pass. Simple to operate with fingertip controls and the ability to empty and fill easily with the lift-off recovery tank. Unit comes complete with batteries, onboard battery charger, auxiliary charging cable, and brush. 20” parabolic squeegee for thorough solution pick-up. 3.5-gallon solution and recovery tanks provide the needed capacity to get the job done. 44.5 pounds of brush/pad pressure loosen soil and debris from floor for removal. Floors are left clean, dry, and ready for traffic vs. a mop and bucket system. 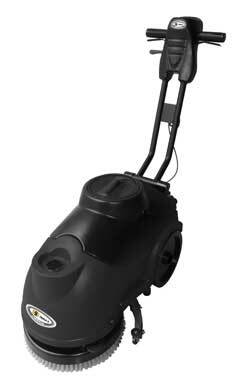 Anyone can comfortably operate the scrubber with its simple controls and sleek design.